I’ve always love dressing up as villains, and what better villain to be than the iconic Oogie Boogie costume! I wanted to do a feminine twist on the character so I knew from the start Oogie was going to need some curves. I also knew that I wanted to have him unraveling with bugs showing since that is one of my favorite parts in the movie. So, I set out to buy an enormous amount of burlap and packages of fake bugs (not your normal everyday shopping list). The first thing I started with was the pants. Let me tell you, burlap is the most frustrating material to sew because true to the movie, it unravels like crazy. After a few days of battling with it, I completed the pants. Based on all that hard work, I decided I only wanted one leg. So, I cut the other one off and fringed it a little to make it look like it was unraveling. Next, I completed the arm with exactly the same struggle. So much so that I decided I was only making one. That is why the other is covered in bugs… oh! I mean, that was a deliberate artistic choice… ah, no it wasn’t. After completing the one arm, I set off to complete the hood. I wanted it to be more feminine so I decided on the hood instead of a full mask. This way I was able to use makeup and the prosthetics I made, another passion of mine. Then it came down to the corset… dun, dun, dun. 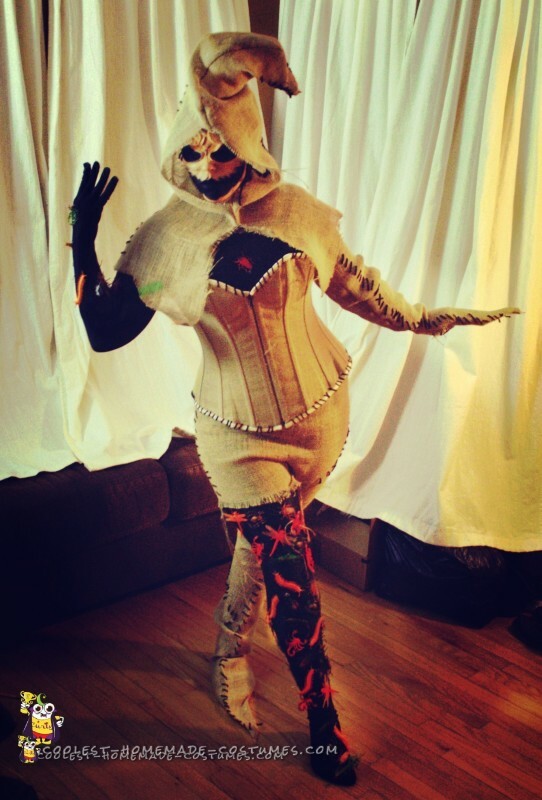 I ended up taking an old corset I had and sewing burlap panels on top of it which to my surprised worked. 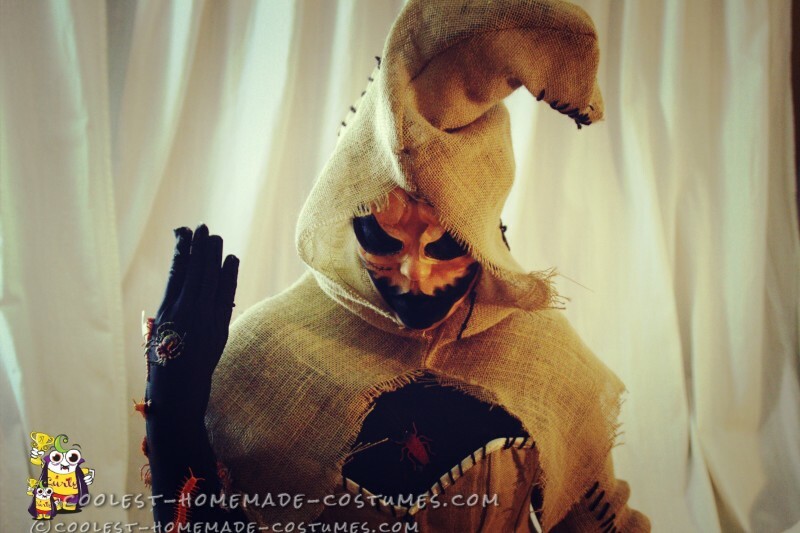 I then went over the whole costume, stitching it with black yarn to give it the iconic Oogie Boogie look. Lastly, I bought a black bodysuit to put underneath it. On top of the body suit is where I hot glued all of the plastic bugs. Warning hot glue is… HOT! I had so many burns, but at the end it was all worth it. I wore the costume to a Comic Con convention in Chicago, and it was so well received by everyone who liked the feminine twist I put on it!